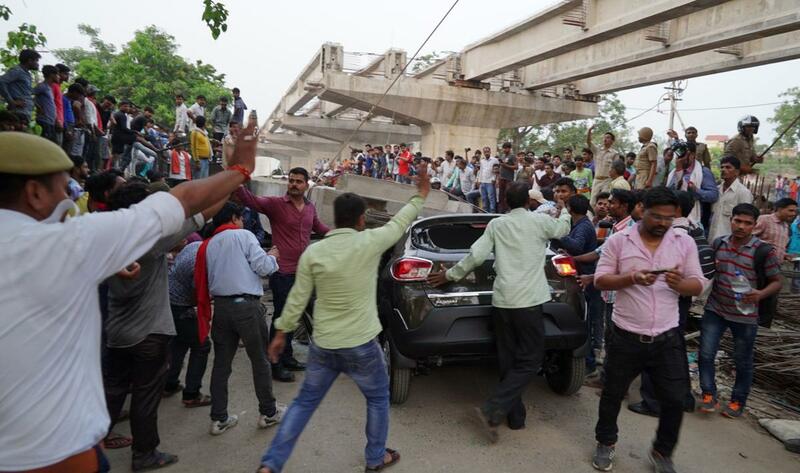 A rescue official said, at least people died after a highway overpass collapsed in northern India and crushing vehicles and passengers under tonnes of concrete. The police said, five injured people were pulled from the wreckage and two people were seriously hurt. Four officials from the state construction agency were suspended in the wake of the collapse on Tuesday, said the local media reports. A Varanasi commissioner Deepak Agarwal confirmed that the construction of the 50 meter (164 ft) collapsed section had been completed in February but the construction work on the bridge continued. The senior police officer PV Ramasastry said, most victims were in vehicles travelling beneath the overpass. The incident occurred in the city’s Englishia Line road area and the images of the incident showed that at least four cars crushed completely by the weight of concrete blocks and some people also visibly trapped inside. The state top officials announced to give a payment of 500 000 rupees ($7 200) to the victim’s families. “Extremely saddened by the loss of lives due to the collapse of an under-construction flyover in Varanasi. I pray that the injured recover soon,” saying, India’s prime minister Narendra Modi has tweeted his condolences.